A new year has come and with it the chance for a fresh start. At the beginning of a new year, many people set goals to lose weight or to exercise more. 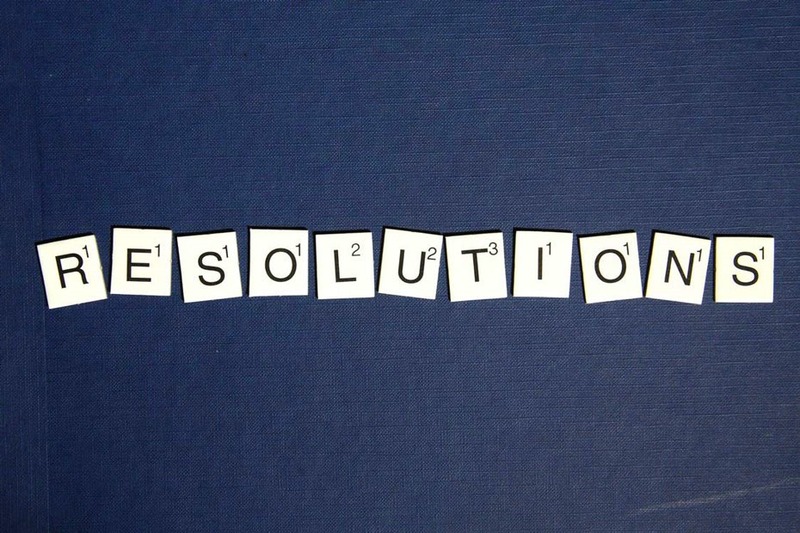 Here at Pathologically Literate, my resolutions tend to take more of a bookish bent. Indeed, a new year calls for new reading goals (and new books!). In 2018, I’m challenging myself to read bigger and better – and hope to take you along for the ride! Here are five of my Bookish Resolutions for 2018 that I hope will lead me to new books, characters, and authors to adore. In 2017, I surpassed my goal of reading 175 books by instead reading a whopping 229 books. Thus, in 2018 my goal for the 2018 Goodreads Reading Challenge is to read a minimum of 200 books. Homeschooling high school has proven to be soul-sucking time-consuming but as always, reading was my salvation in 2017, and I’m hoping it will continue to be so in 2018. 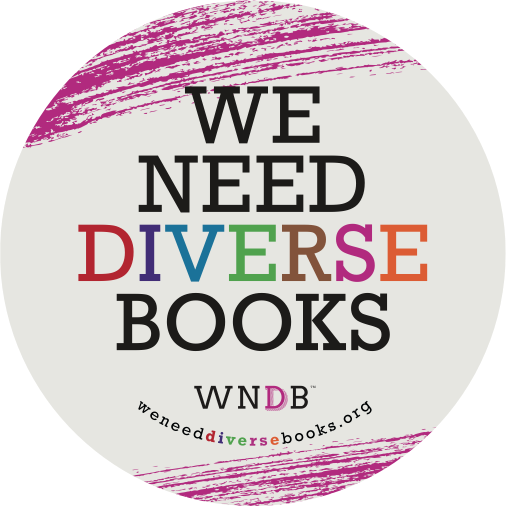 I’ve made it a goal of mine since the beginning of 2015 to read more books written by or about people of all diverse experiences, including (but not limited to) LGBTQIA, people of color, people with disabilities, and ethnic, cultural, and religious minorities. Unfortunately, good intentions don’t necessarily translate into good results without mindful action. In 2016, I read 37 books that were written by or about people of diverse experiences. One of my resolutions in 2017 was to be more intentional about the books I chose in order to increase this number. I’m happy to say that in 2017 I read 118 books that were written by or about people of diverse experiences, almost triple that of the year before. While this is encouraging, I still feel it is not enough. Thus, it is still a goal for me to be more intentional about the books I choose this year in order to read more diversely. I read nine works of non-fiction in 2017. NINE, y’all. Most of which were cookbooks or dog training manuals. I feel this is unacceptable, as I think it is my responsibility to contribute to self-improvement and self-awareness by reading more about the world around me. Now, obviously, Fiction is my jam. I do admittedly shy away from Non-Fiction, however, I have a plan of action. I’m going to start small, and hope that things grow from there. To begin with I intend to read a minimum of one Non-Fiction book per month in 2018. Not only that, but the book must be something of substance – cookbooks do not count toward this goal. I’m hoping to start off in January with Just Mercy by Bryan Stevenson. In 2017 I made it a goal to pay more attention to the Pathologically Literate blog. I had gone from posting daily when I first created the blog a few years ago to posting only a few times a year. Last year I wound up posting a monthly roundup of my reading as well as a few other posts here and there. While this wasn’t exactly the presence I’d hoped to foster, it was more time than I had spent the previous year, so we’ll call that a win. In 2018, I would like to increase my presence on this blog even more. I hope to continue with my monthly bookish roundups, share other bookish fun, as well as write about our adventures in homeschooling and life in general in the Pathologically Literate household. Hold on to your hats, y’all – I’m breathing some fresh air into this little ol’ blog! It is my hope that 2018 will be a year of change – for the better – for our country and for us as individuals. I hope that for myself it is going to be a year of good reads, good writing, and good times. I sincerely hope you are here with me for the journey. Happy Reading in the New Year, y’all!! What are your bookish goals for 2018? 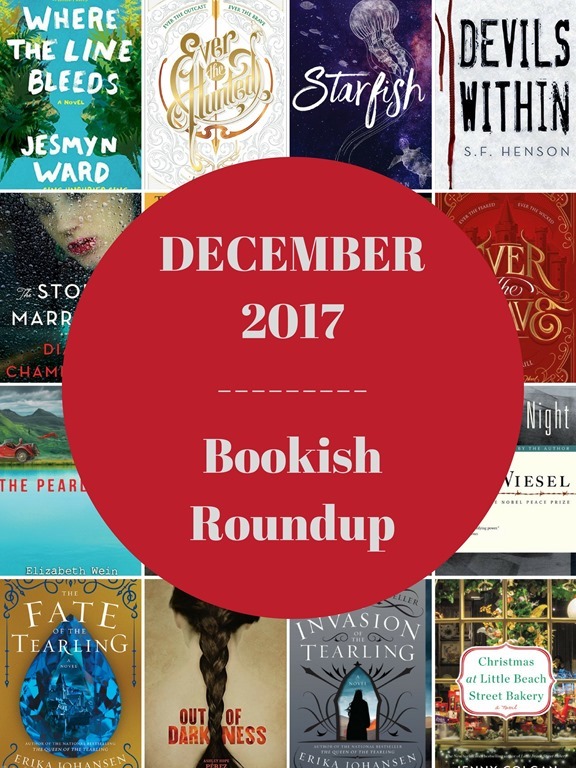 I’m so excited to share with you the final Bookish Roundup of 2017!! December started out amazingly well as I raced through the books, but towards the end of the month, things began to slow considerably for me. That said, I still managed to pack a total of 16 books under my belt (bringing my total books read in 2017 up to 229!). 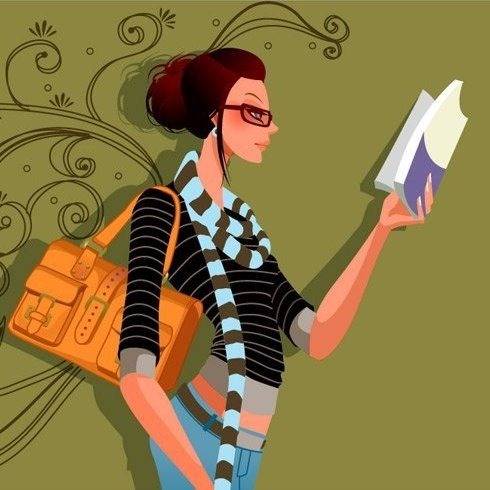 I read in my comfort zone, out of my comfort zone, and around my comfort zone – I read all kinds of books in December, and I enjoyed almost all of them immensely. I was quite pleased to finally pick up the Night trilogy by Elie Wiesel, something that, I’m ashamed to say, had been on my TBR for over twenty years. Hauntingly, boldly, and bluntly, Wiesel tore my heart to shreds. I worked quite a bit of YA into the mix, and even got some YA Fantasy on that list for good measure. All of those were great reads that I definitely recommend. I had a lot of heavy reading in December, so it was nice to be able to work in a little Jenny Colgan, my go-to, feel-good cozy romance diva extraordinaire. If I had to choose a top three out of all 16 books I read, I would have to go with Starfish by Akemi Dawn Brown, Devils Within by S.F. Henson, and Ever the Hunted by Erin Summerill. All three are YA novels; all three are spectacular. I’m super excited to get started on my reading list for the new year, and to see what new books come into my life as well. I just know 2018 is going to be a year of good times and even better reads. I wish the best to all of you and hope you have Happy Reading in the new year! What was the last book you read in 2017? 2017 is coming to a close, and that means I now get to share with you my favorite books of the year. I read sooooo many good ones this year, y’all (229 books in total, as a matter of fact!) and it was torture trying to narrow things down to a list of just ten books. You almost had a list of my Top 35 Books of the Year… That just didn’t have a nice ring to it, however, so I worked my tail off and came up with my top ten favorites (plus just a few more, because that’s how I roll). As always, click each title to be taken to a summary of the book. Now, you may have noticed something about this list that is a little unusual compared to past lists… Yes, you are correct: three of the titles are YA books! 2017 was the year of the YA novel for Pathologically Literate!! I’m not sure of the exact stats (those are yet to come in my PIE CHART post in January) but let’s just say I read… a crap-ton of YA novels this year. I know, I know – Hell did not freeze over, like I claimed so many times that it would before I would become a YA fan. What can I say, y’all? There is some quality stuff out there and I enjoyed the hell out of it. While I was choosing which arm to cut off narrowing down my selections, I just had to tack on some honorable mentions, as I could not keep my list down to a mere ten books. This, too, was a tough job as I wanted to choose so many of the wonderful books I read this year. Please don’t forget to check out my “2017” Shelf on Goodreads for a look at everything I read this year. 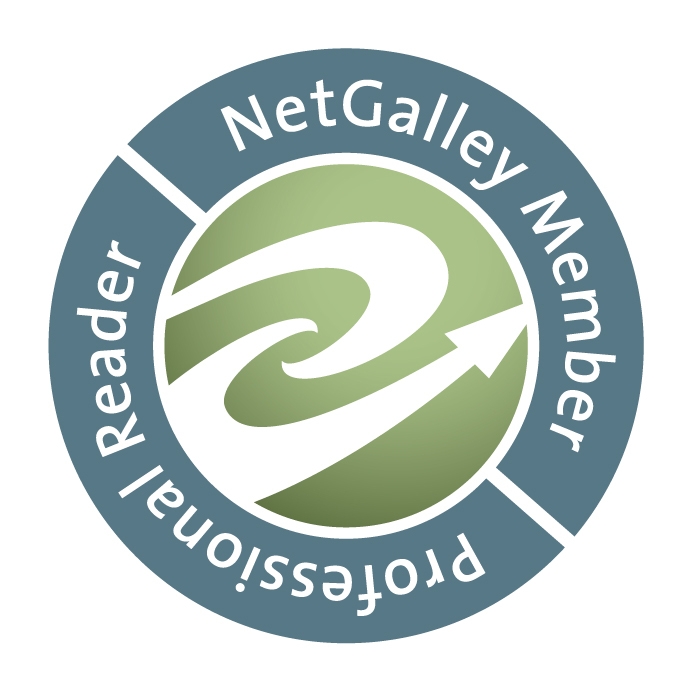 While you’re there, be sure to add me as your newest Goodreads friend!! Oh, yes, y’all – another anomaly on the Honorable Mentions list, isn’t there? I’ve also mentioned in the past that Harry Potter was not something that called to me, and it wasn’t – until now. Indeed, 2017 was also the year of Harry Potter – in which I tentatively picked up the first book in the series, liked it, then wound up absolutely devouring the rest of the series in little over a week. This sparked a flurry of excitement within my online book club, and I had much fun discussing the various books in the series with my friends there as I read them. 2017 was a year of good times and good reads, and I can’t wait to see what’s to come in the next year. Bring it on, 2018!! 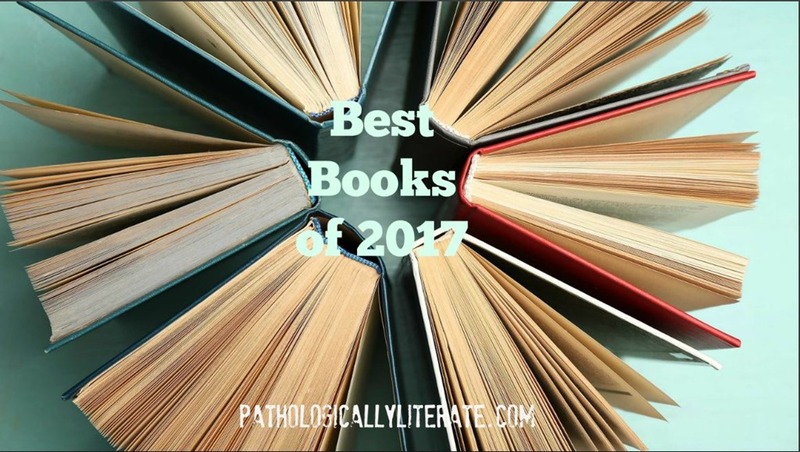 Did you have any favorite books of 2017? Share in the comments! Whew! November was a crazy busy month here in the Pathologically Literate household, y’all, and am I glad it is over. C’mon, December – hit me with your best shot!! Despite the craziness of November, I was able to read a total of eighteen books and participate in a five-day Thanksgiving Readathon. Thus, I’m not complaining too much. So… November, 2017 was the unofficial Month of Cheesy Romance Novels. I loved getting to know the Winston Brothers, and started on a Sarah MacLean series as well. In fact, there were several great reads this month, however, my favorite novel by far was The Story of Arthur Truluv by Elizabeth Berg. Berg has been one of my favorite authors for about twenty years now, but her last few books have really been hit or miss for me. Folks, with The Story of Arthur Truluv, that old Berg magic is back!! Arthur stole my heart about two minutes in and, nearly a month later, has yet to give it back. Now that December is here, I have twelve more books to read to reach my unofficial goal of reading 225 books in 2017. Piece of cake, y’all!! In fact, barring natural disasters, I believe I shall surpass that goal. Yay, me!! Keep your eyes peeled in January for an update on my Bookish Resolutions for 2017. Until then, friends – Happy Reading!! It’s finally Thanksgiving week, y’all, and time for a break from everyday life! Homeschool is on hold until next week. The Boy has plenty of activities to keep himself busy with. Poppy is in charge of Thanksgiving dinner this year (hallelujah!!). All I need to do now is sit back… and read, of course! 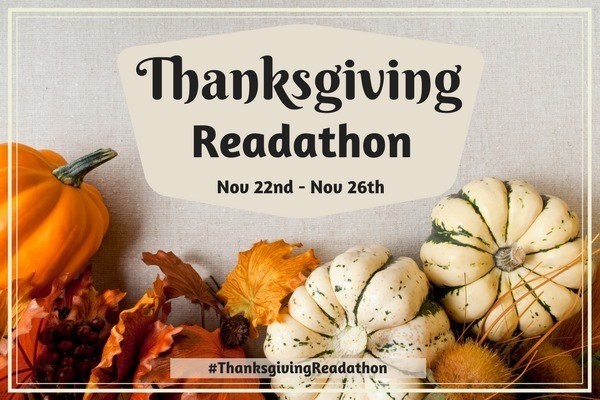 What better way to do that than to participate in the first ever official Thanksgiving Readathon, right? 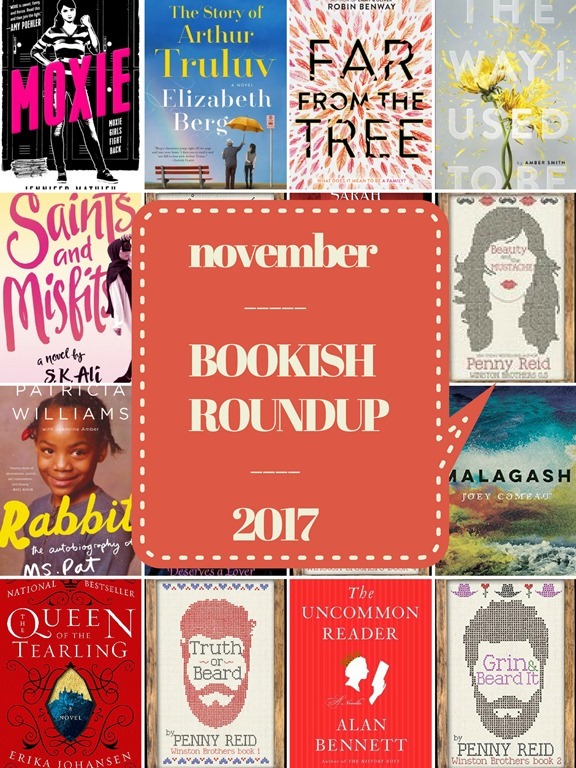 The Thanksgiving Readathon, hosted by the blogs Novels and Nonfiction and Death by Tsundoku, will run from Wednesday, November 22 through Sunday, November 26, 2017. 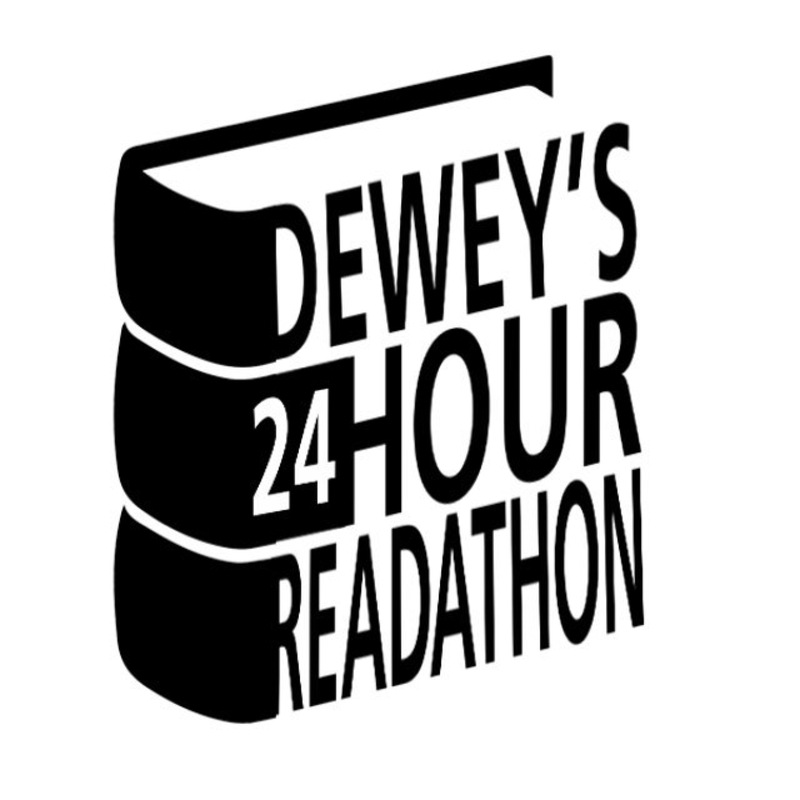 It’s a very informal and laid-back style of Readathon, in that your goal is simply to read as many books as you can over those four days. No rules or regulations, no competition, no pressure. My kind of thing, for sure. For more information about how you can participate, read this post. I have several other books on my Kindle Paperwhite as well as a stack from the library that are waiting patiently for me, so things are not limited to just the four mentioned above by any means. I cannot wait to get started and down to business. The main concern I’ve heard from friends is, “Isn’t this going to interfere with your Thanksgiving plans?” To which I respond, “What plans? !” Not really, y’all. But Thanksgiving, for my small family, has been very laid-back for the last few years. It’s just Poppy, The Boy, and myself eating a happy meal on the special day. There’s no big to-do or traditional gathering, etc. I definitely prefer it to Thanksgivings past, where we did have to go through the motions of a big holiday feast. This is so much more relaxing, and meaningful, in a way. The best part of our small, laid-back holiday is, of course, that I have mucho time for reading!! I’m so excited to get started on the Thanksgiving Readathon, so I’m going to go do just that. I hope you decide to join me and have a blast yourselves! Either way, y’all… Happy Reading!! Do you celebrate Thanksgiving in your home? What are some of your traditions? 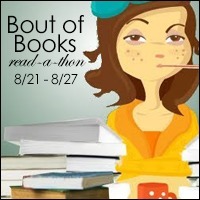 If you’re participating in this year’s readathon, share your TBR below!! I love Fall, y’all!! I adore that crisp, cool air and spend copious amounts of time reading on my front porch with a blanket and coffee (or hot cocoa!) each day. Fall has been good to me this year, too, in that I had an awesome reading month in October! I read a total of nineteen books, raising my total number of books read for the year to 195. Woo-hoo!! We spent a lot of time training and caring for little Miss Tootsie all month, toting her to and from Puppy Kindergarten classes and working on the skills we learned there here at home each day. 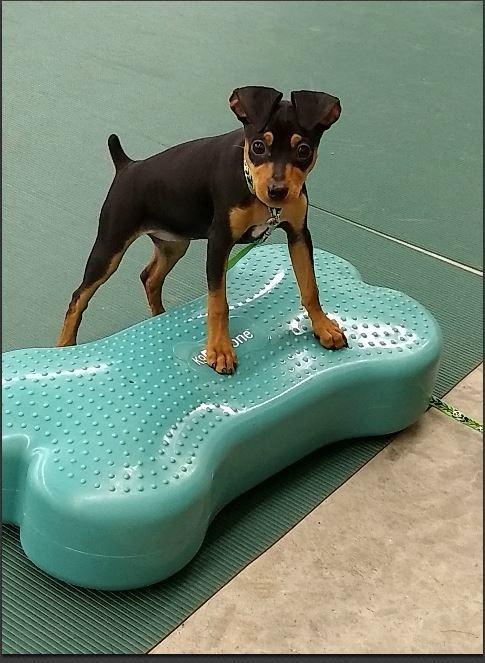 She is growing a little each day, and although she’s still a tiny little stinker, Tootsie is light years away from where she was when she came to us. I know that your real questions is, is she growing on me yet? Yes, and no. She has definitely become somewhat easier to handle over the last month or so, but the peace I knew before she came into the household is still gone. The perfect equilibrium that my sweet Sheltie, Ruby, and I had enjoyed has been shattered and we’re still trying to figure out how to fit Tootsie into our lives. One thing is for sure, however; The Boy is one happy camper. He absolutely adores Tootsie and works tirelessly to care for her and to make things easier for me when it comes to her care. He’s a keeper, that’s for sure. Wow. Where do I even begin? So many of the books I read last month were amazing. Jesmyn Ward’s Sing, Unburied, Sing was both brilliant and powerful. Becky Albertalli is a new favorite YA author; I hear that she is collaborating on a new novel with YA author Adam Silvera – can’t wait to check that one out! Castle of Water, recommended by a book club friend, was everything it was promised to be – many tears were shed with this one, y’all, so be prepared. Jessica Cluess’s Kingdom on Fire Series is excellent. Speaking of puppies (as I was a moment ago) The Art of Raising a Puppy by the Monks of New Skete was a good read as well, and helpful to The Boy and I on many points. 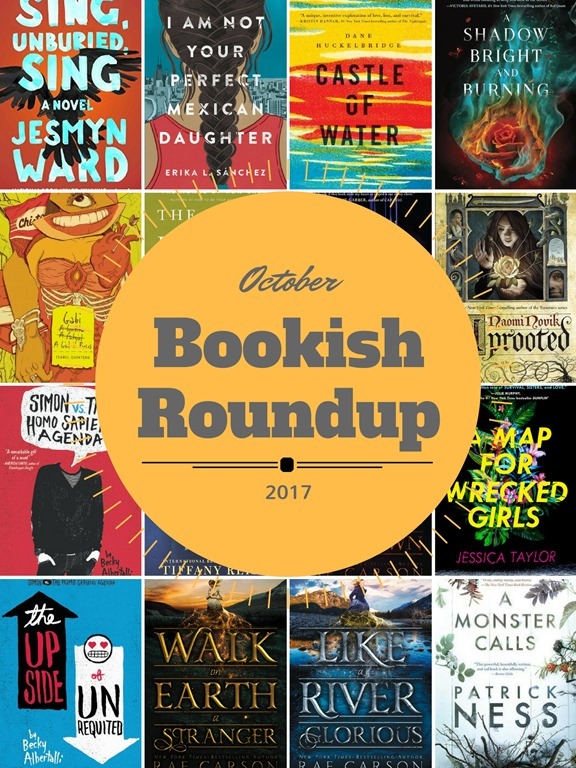 As I said, October was a fantastic month for reading and I’m hoping that November will be the same (or better!). Temperatures are still in the 50’s and even 60’s on some days here in Nebraska, so there is still plenty of porch time ahead for me. I have some great books waiting for me on my November TBR, and I can’t wait to get started. Happy Reading to you all!! Where is your favorite place to read in the Fall? It’s Fall, y’all!! My favorite season is finally here, and I’m so excited! While I haven’t exactly seen my favorite things about Fall yet (apart from the Pumpkin Caramelicious at Scooter’s Coffeehouse!! ), the air is fraught with anticipation and it won’t be long before temperatures drop and that crisp, cool air blows through my hair as I read on my porch on a sunny Fall afternoon… I can feel it now. Oh, yes – Fall is here, y’all!! Unfortunately, my pre-Fall reading habits have taken quite the hit this year. I was moving along at quite a pace the last few months, hitting between at least 15 to 20 books per month. And then… The Boy bought a new puppy with his earnings from his summer job. Was this Pathologically Literate Momma happy about that? Well, it is what it is, and there ain’t no turning back now. One thing is for sure, a brand new 6-week-old puppy in the house is almost like having a new baby in the house at times – especially when it comes to trying to get things done. Granted, she is now 11 weeks old and we’ve adjusted a little bit, but she’s still taking up a looooot of time and even though The Boy is pulling his weight, a lot of that time seems to be my own which has made reading a lot harder than it used to be. Where it used to take me 1 1/2 to 2 days to read a book, it’s been taking me more like 3 or 4. Yikes! 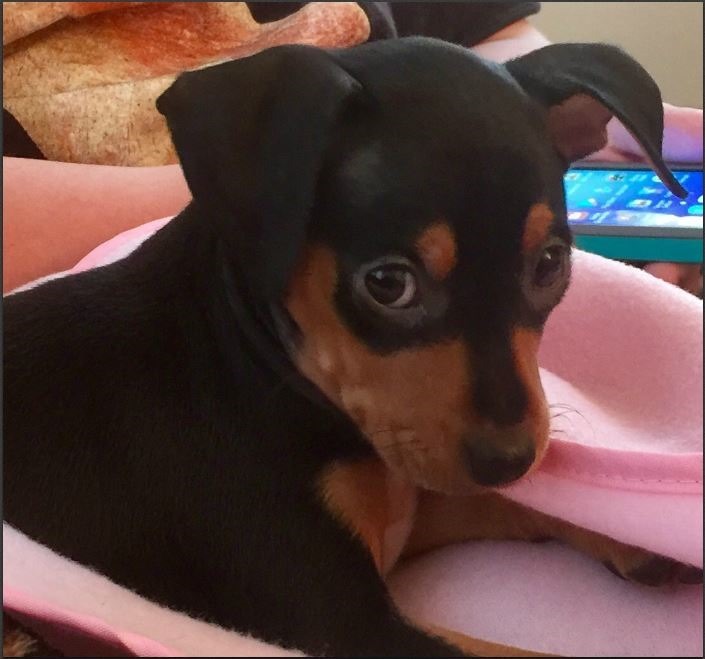 But how can you be mad at this cute little face…? 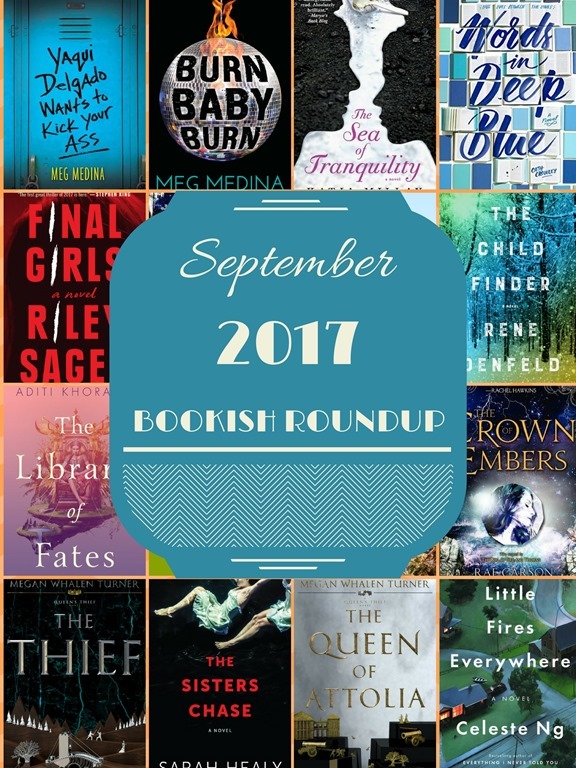 Ten of the fourteen books I read in September were YA titles. Both of the Meg Medina titles were amazeballs. The Sea of Tranquility was as wonderful as everyone had promised it would be, as was The Girl of Fire and Thorns Trilogy. Words in Deep Blue was a testament to book lovers everywhere, and I adored it. All four of the adult fiction titles I read in September were winners, too. Celeste Ng’s sophomore novel, Little Fires Everywhere, was on point and even better than her first. I really lucked out last month – I may have read less, but at least they were worth my limited time! October is already shaping up to be a better month, methinks. I believe I’m beginning to get back into my reading groove (please, God!). I recently checked out some awesome titles for my Kindle and from the local library, and have some exciting ARCs to read as well. All that reading time I’m planning for my front porch this Fall is going to be put to goooood use, my friends. Can’t wait! Hope you have a Happy Fall full of Happy Reading, y’all!! Where is your fave place to read in the Fall? Fall is almost here, y’all, and I’m soooo excited! Fall is my favorite season of the year: the cooler temperatures and crisp air does my body good – as long as that sun keeps shining, anyway. Gotta have my sunshine, y’all. Despite the hot, hot summer we had here in Nebraska, August was surprisingly mild as far as temperatures went – most days were in the 80’s or even below. If we have to have Summer, that’s the kind of weather I like. Because of the cooler temps I was able to spend more time outside reading on my porch – one of my fave places to read. It was a CRAZY month, though, y’all. 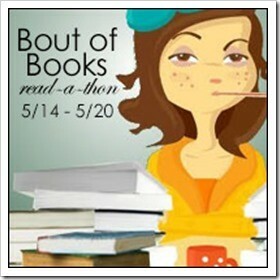 I participated in the Bout of Books 20 Readathon, which was so much fun. Unfortunately, right smack in the middle of the readathon I wound up on the hospital’s ICU ward for two days! I was in the hospital for a total of four days, which really cramped my reading style – but I didn’t let it keep me down. I finished out the readathon, anyway. Books for the win, y’all!! So many of these books were winners, y’all, but one stood out by a long shot. The Seven Rules of Elvira Carr by Frances Maynard will definitely be included in my top books of 2017. It was beautiful and sweet and funny and sad, and Elvira Carr stole my heart almost as soon as I opened the book. It is a must-read, and I expect a full report from each of you!! It’s another mild Summer day today, y’all, and I’m off to read on my porch again while Poppie and The Boy gorge themselves on Saturday college football (ugh). I hope you have a wonderful September and until I see you again, Happy Reading!! What was your fave read in August? We made it, y’all! Bout of Books 20 has come to a close, and what a doozy it was! I read, I laughed, I cried… I went to the ICU. But you can’t win them all, I suppose. In closing, I will have to say that this was definitely an eventful week for me (not just because of BoB!) and while I’d like to have skipped over some of it, I’m so glad I got to be a part of Bout of Books. I had so much fun interacting with all of the great people reading along with me, and can’t wait to do it again in January!! 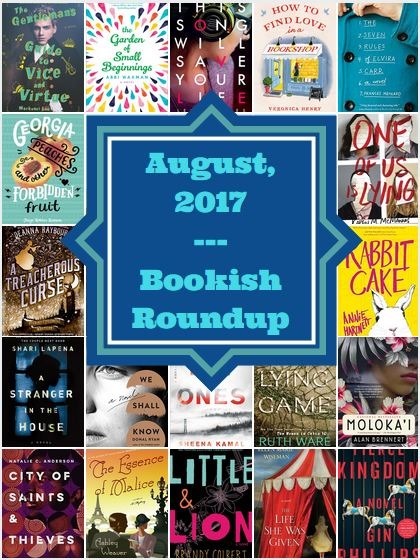 August has nearly come to a close, and you know what that means: it’s almost time for another Bookish Roundup! Stay tuned later in the week and until then, Happy Reading, y’all!! You can’t keep a good man (woman) down!! I’m home from the hospital, y’all, and back on track with Bout of Books 20. While I didn’t get much reading done while I was cooped up in the hospital, I certainly made use of my resting time once I arrived back at home and read the rest of my day away. One day left, y’all! While it’s clear I won’t meet my original goals, I still have a chance at finishing my current book and possibly another one as well. My fingers are crossed. Wish me luck, folks, and as for yourselves: Happy Reading! !